The Conservatives seem to be targeting Facebook users in marginal constituencies with anti-Jeremy Corbyn attack adverts, designed to draw away the Labour faithful. Labour are also using Facebook advertising, but their messages are not focused on leaders and their personalities. BBC Trending is working with BBC Newsnight and BBC local radio to shed light on the role of social media advertising in the general election. We've asked readers, viewers and listeners to send examples of political adverts that you've noticed on your social media feeds. We're trying to overcome the opaque nature of political Facebook advertising (often dubbed "dark advertising") which is often only seen by the people who are targeted. We have been able to identify a few clear trends from the hundreds of ads that we've been sent so far. Here's the strongest: the Conservatives are paying for numerous adverts that attack Labour leader Jeremy Corbyn or his close allies, particularly John McDonnell and Diane Abbott. They broadcast a broadly negative message - warning people about the perceived threats of a Corbyn-led government. Image caption A Conservative attack advert that was targeted at a voter in Bishop Auckland. The Conservative adverts we've seen focus on three key policy themes: Brexit, taxation and national security. However, on all these themes, a common message is employed to critique Corbyn: that it would be too "risky" to entrust the Labour leadership with government. According to Tim Bale of Queen Mary University, an expert in Conservative Party politics, the Tories are keen to play on Theresa May's favourable leadership ratings. "The Tories know from work done by [top campaign strategists] Lynton Crosby and Mark Textor that Corbyn is Labour's biggest weakness and May is their biggest strength," Bale told BBC Trending. "Targeting Corbyn's leadership is a no-brainer." The Conservative attack ads are often reactive - responding quickly to current events. The below advert was sent to us, just hours after Corbyn stumbled over childcare figures in an interview with BBC Woman's Hour. Negative political adverts are particularly widespread in the United States, where parties routinely attack the credibility of a candidate and try to alienate their natural supporters. Donald Trump's election campaign, for example, directed anti-Clinton Facebook adverts at potential Clinton supporters, including African-Americans and young women. There may be some signs of a similar strategy now being used in the UK. Our crowdsourced anti-Corbyn adverts were almost exclusively sent to us by individuals whose Facebook "likes" would identify them on the left of the political spectrum. The Tory adverts are different in tone from US "attack ads," however. 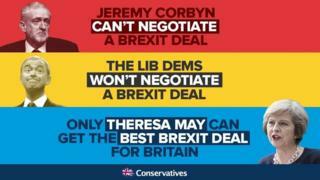 Though negatively spotlighting Corbyn, they also contain positive messages about the Conservatives, in an attempt to persuade voters to lend their vote to Theresa May's party on 8 June. Our crowdsourced experiment has also revealed more about the local ambitions of the Conservatives. We found that the Conservatives are targeting Labour or Liberal Democrat seats in the Midlands and the North, where a significant proportion of the electorate voted for UKIP in 2015. We have seen adverts from 12 constituencies that match this profile. The aim seems to be to not only attract UKIP voters, but also Labour supporters with reservations about Corbyn. "The geographical targeting on Facebook is pretty granular," says Carl Miller of the Centre for the Analysis of Social Media at Demos. "This allows political parties to focus their adverts on target seats." For example, one individual in our survey is a resident of Newcastle-under-Lyme - a Labour-held marginal constituency that is under challenge from the Tories. A considerable number of people in the constituency voted UKIP in 2015 - 16.9% of voters. With UKIP lagging well behind that level nationwide in the latest polls, however, the Tories have been aiming to pick up ex-UKIP voters. But a uniform swing from UKIP to the Tories is by no means guaranteed. Thus, turning Eurosceptic Labour constituencies into Tory seats might rely on persuading some Labour voters to turn their backs on Corbyn. This is certainly the case in West Bromwich West - another place where anti-Corbyn adverts have been seen by voters who sent ads to us. The constituency is a safe seat held by Labour MP Adrian Bailey and, at the last election, the Tories finished third in the constituency with 8,213 fewer votes than Labour. UKIP came second, with 8,836 votes in total. The Conservatives might expect to absorb a large chunk of the UKIP vote in June, but the party will also likely need to swing a significant chunk of Labour voters in order to achieve what would be an upset. Image caption One of the Conservatives' attack adverts - directed at a voter in West Bromwich West. Anti-Corbyn posts are also being deployed in Conservative-held areas, which are potentially at risk of being lost to the Liberal Democrats over the issue of Brexit. We have seen adverts in four such constituencies. Multiple individuals living in the Oxford West and Abingdon constituency contacted Trending to say that they had been targeted by the ads. This constituency is a Conservative seat, but 70% of Oxfordshire voted Remain in the EU referendum. In 2015, the Liberal Democrats - a proudly pro-EU party - finished second in the constituency, and the Conservatives seem keen to fend off an anti-Brexit backlash by encouraging Labour voters to back the incumbent candidate. Labour and the Liberal Democrats have also been pushing adverts on social media, though with a different tone. Labour ads on Facebook focus on positive messages, often using the party's election slogan: "For the many, not the few". Meanwhile, Liberal Democrat adverts focus on the issue of Brexit - with of course a much different line than the Conservatives. Many of the ads attack May and Corbyn on their approaches to Brexit, though they often also carry an uplifting final message. A word of caution is in order though: our methodology is limited by the fact that we can only see what you, our audience, send us. In addition, though Facebook ads can be targeted towards towns and cities, and in some cases areas within major centres, they can't always hit individual constituencies. Indeed, several voters saw ads for candidates in neighbouring constituencies, or ads from parties that had very little hope of winning their local seat. These adverts are of course an incomplete glimpse into the scale of social media advertising in Britain. Carl Miller of Demos says that he will be "astonished" if UK political parties spend less than a total of £3.5 million on targeted Facebook adverts during the general election campaign. However, even such a small snapshot provides an illuminating glimpse into the electoral strategies of political groups and digital campaigning as a whole. For more on how the parties are using social media during this election, watch Newsnight tonight on BBC2 at 22:30.